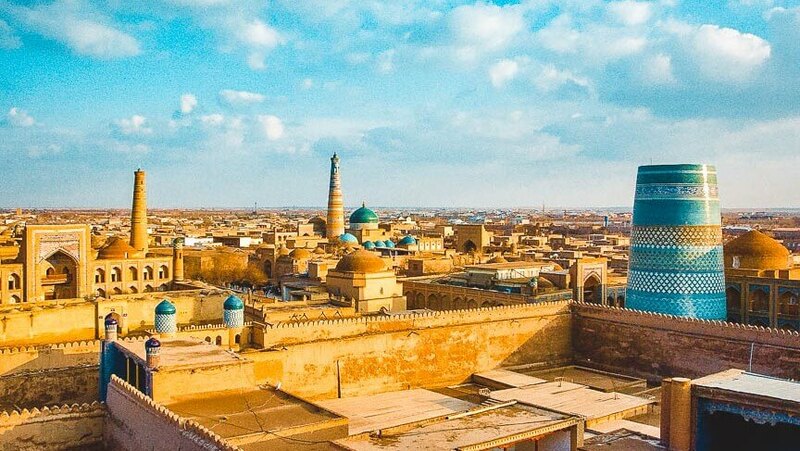 When you compare it to the ancient cities of Bukhara and Samarkand, Khiva is a relative youngster. Don’t let this put you off making a visit. UNESCO still deem it worthy of being a World Heritage Site and its oriental atmosphere is unforgettable to any visitor. 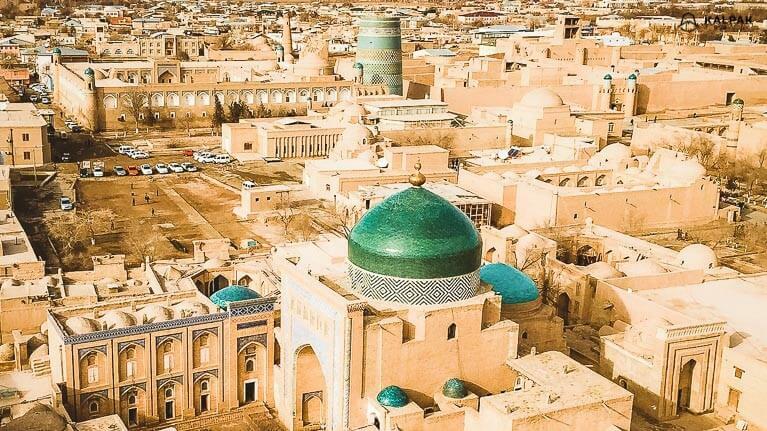 Imagine Khiva as a city of two halves: Itchan and Dichan Kala, respectively the inner and outer city. Dichan Kala is home to about 90% of Khiva’s resident population. Itchan Kala, by contrast, is more like an open-air museum with few permanent inhabitants. This inner city is full of restored historic buildings and its pedestrianized center is a delight to wander. Its Islamic architecture has changed little since medieval times. 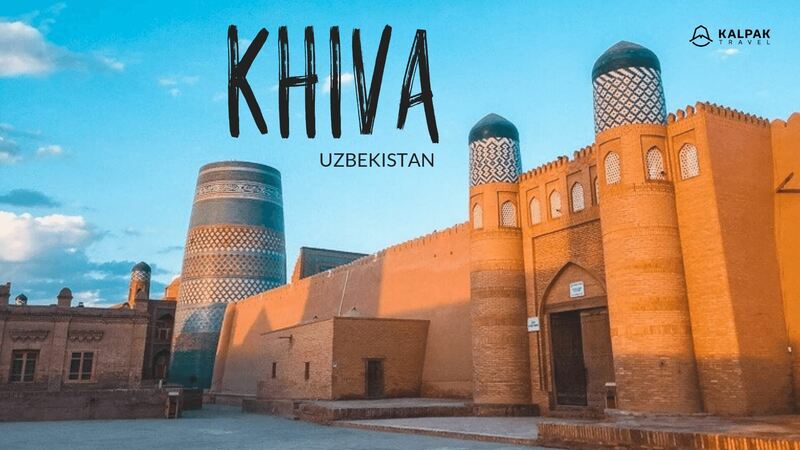 Let’s have a look at the top places to see in Khiva. The walls of the old city encircle more than 50 architectural monuments and around 200 houses. They stand ten meters high in places and measure six meters thick at their base. These substantial fortifications were begun in the 5th century though what you see today isn’t original – the walls have been rebuilt many times over the centuries. The current stonework dates from the 18th century and was restored in the 1970s; it’s possible to climb up. There are four gates puncturing the walls, known as darvaza. Bachtscha is the north gate, Palwan the east, Dascht lies to the south and Ata in the west. Kunya Ark dates from as early as the 5th century, though the main part of this citadel and fortress complex is a couple of centuries newer. It had all kinds of functions, including a mosque, Arsenal, harem along with many rooms dedicated to the royal residence and even a mint, where money was issued. The Ark served as a government building and home to the Royal family until the 1840s. A replica of the silver throne of the Khan is there, but the original is in the Hermitage Museum in St. Petersburg. 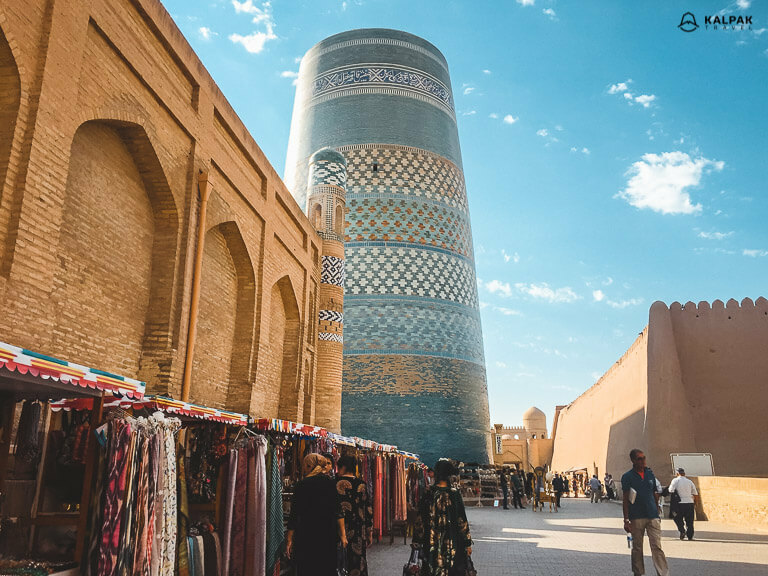 The colorful tiles of the blue minaret of Khiva, Kalta Minor, make this one of the highlights of many visitors’ trips to Uzbekistan. Standing at 29 meters tall, it was intended to be much bigger. However, when it reached one-third of its planned height construction stopped. There are several theories as to why this was. One is that it was realized that when the minaret was completed, people would be able to see into the Khan’s harem. Another holds that the Khan heard that the architect had been tasked with building an even taller Minaret in Bukhara; considering this a treasonable offense, he threatened to kill the architect, who escaped leaving his work unfinished. Less fantastic, but possibly more likely, a third theory holds that the main contractor Amin Khan died in 1855 before the minaret could be finished and yet another that the money ran out. Whichever story is true, it’s an unmissable sight. Next door is the Amin Khan Madrassa which is now a hotel. 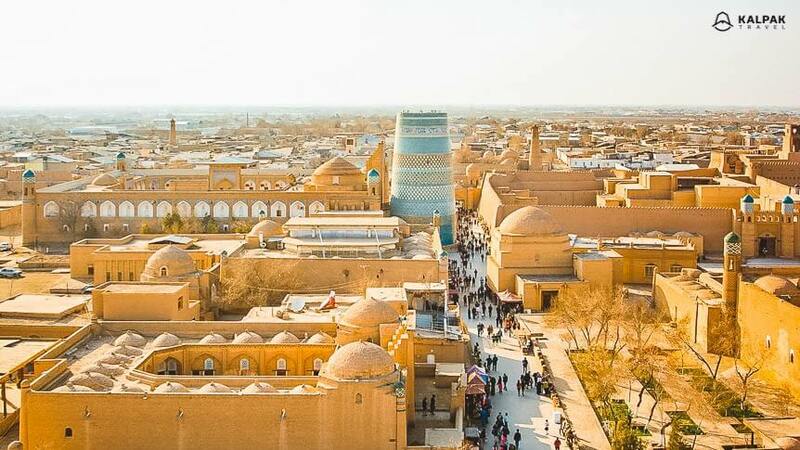 One of the best views of the city can be had from the top of the Islam Hoja Minaret which takes its name from the chief advisor to the two last Khans of Khiva. He was a rich and well-educated man who had studied in Paris, instrumental in advancing political and economic relations with Europe and Russia. Before his assassination in 1917, he built the city’s first European-style school as well as a hospital and post office. The minaret’s platform stands 45 meters off the ground; the structure itself adds another 12 meters to the total, making it the highest minaret in the city. With its intricate brickwork and blue, turquoise and white mosaic stripes, the minaret reminds us of other ancient towers common in Central Asia. Indeed, it was built using techniques from the 12th to 15th centuries. However, it is a deceptively new building, little older than a century. It is also part of the mosque and madrassa with 42 rooms standing right next to it. The Juma Mosque was synonymous with Friday mosque as male Muslims gathered there for the communal weekly prayers. The mosque is one of the oldest buildings in the city as it dates from the 10th century, though it was rebuilt in the 18th century. 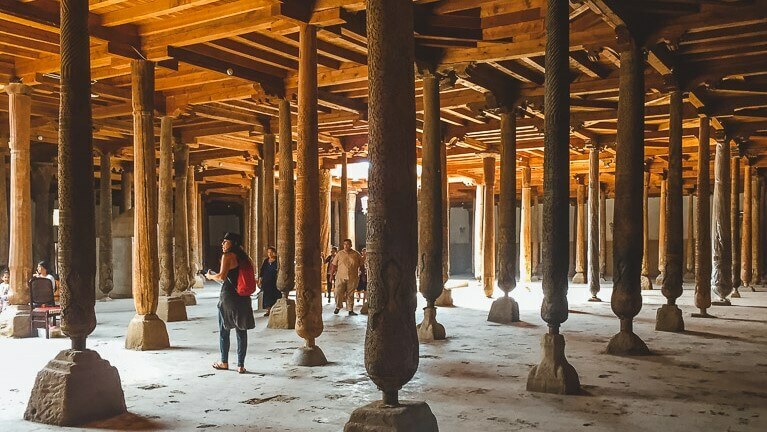 The large prayer hall seems like a dense forest with its 212 wooden pillars. Each of the pillars is carved and decorated in a special manner and with ornate decoration. This art of Khoresmian wood carving has been refined over the centuries into a masterpiece of handicraft technique. 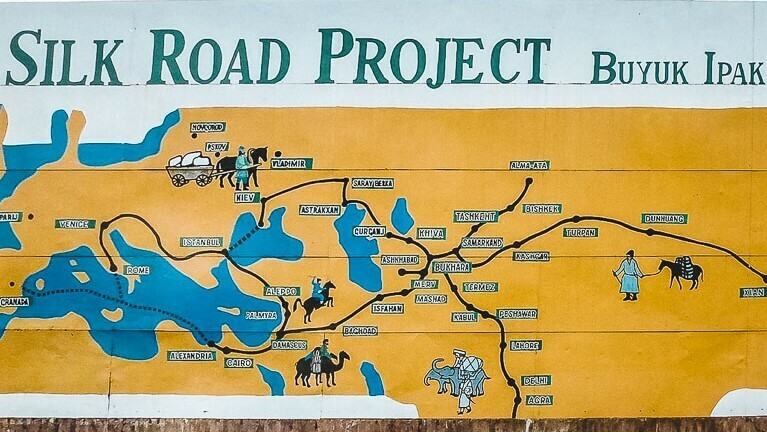 One of the pillars comes from India, showing just how close relations were between the countries of the Silk Road. The mosque’s design ensures maximum light and a steady breeze enters the building year round, something that pleases the many tourists that come to admire this fantastic landmark. Tash-Khovli Palace was built in the 19th century and has three large yards connected with numerous corridors and passages. It was built between 1832 and 1841. One of the great delights of visits is to absorb the splendor of its exquisite decoration, such as carved wooden pillars and stonework. It also features rooms known as aiwans, fully tiled and open to the courtyard. The palace contained a harem right up until the 1920s which was guarded by eunuchs. There were also ceremonial and entertaining spaces as well as a trial yard where a court held its sessions. Once the city walls protected the population from occasional incursions from tribal raiders. They also did a good job of ensuring slaves were kept inside the old city. In medieval times, it was a terrible place – and the flourishing center of the slave trade. Today it is a serene city popular with tourists. On the outer walls, you will see graves, whose brave spirit is believed to protect the city. This happens in two ways. It was considered an honor to be buried at the walls of the city and there was a belief that no corpse should be carried in through the city gates as it was a bad omen. As well, for superstitious tribal invaders it was unacceptable to destroy the graves, thus the graves were supposed to protect the city walls from destruction. 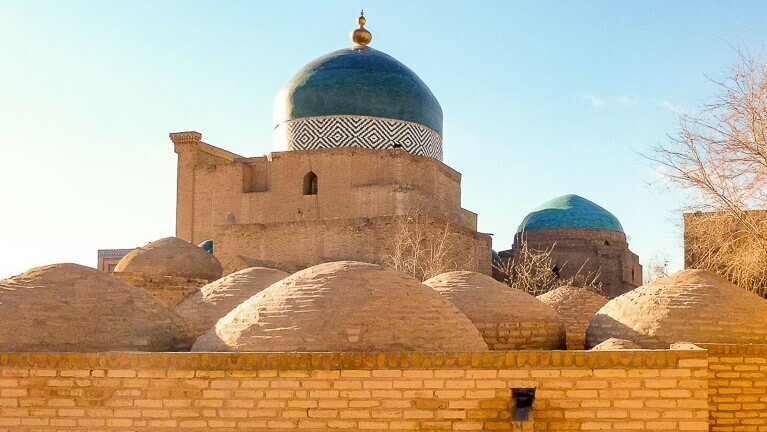 The largest dome in Khiva is dedicated to local hero Makhmud Pahlavan. Legends recount his strength, intelligence, and achievements in poetry and warfare. He was an almost undefeated wrestler. He died in 1326 and the small mausoleum became a prominent place of pilgrimage for local people. It grew into mausoleum complex in the 18th century. The reconstruction of the mausoleum that travelers see nowadays dates from 1810, though up until 1920 new elements have been added to the complex including royal dynastic crypts. 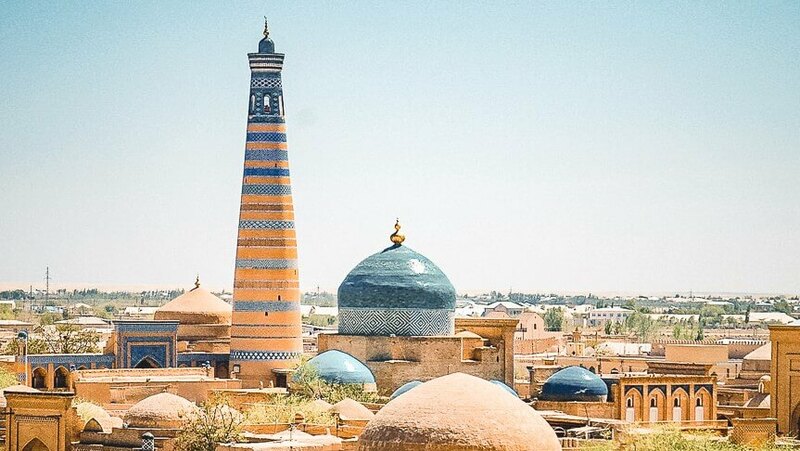 Khiva has many more interesting monuments and buildings to stroll around. 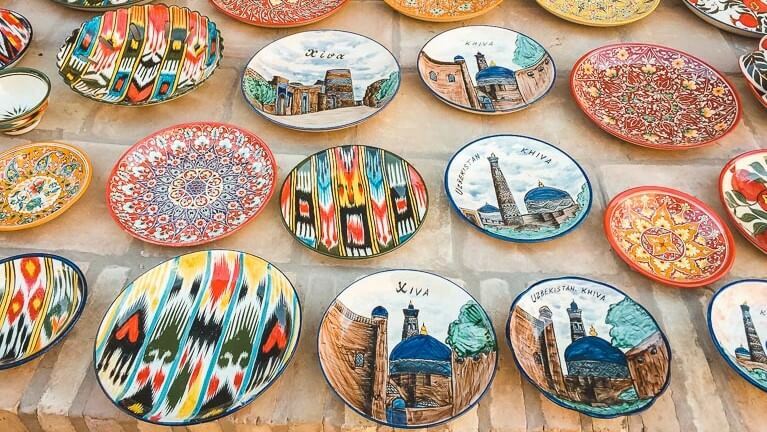 After sightseeing, you can get lost in the narrow streets of the old city among mud houses where people still bake fresh bread or celebrate weddings. Artisans go about making puppets, silk, metalwork and wood carvings as their ancestors did. Stroll around Itchan Kala to find local souvenirs, embroidered bags and wood carvings. 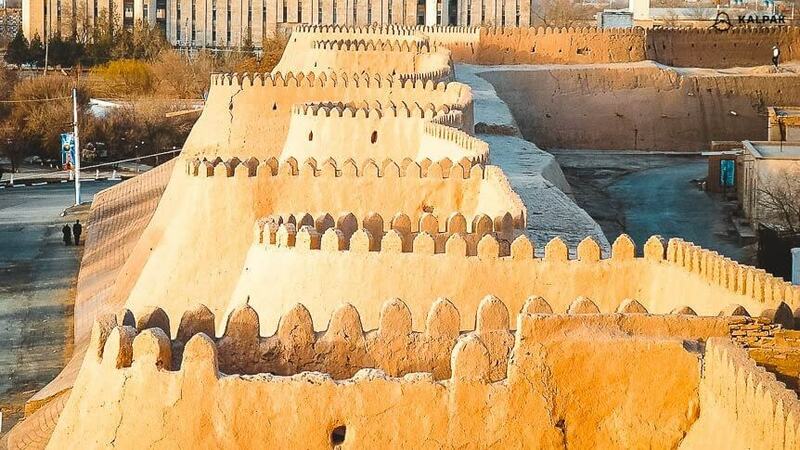 Khiva was presumably founded at the beginning of our era -AD and larger city grew from the 10th century on. 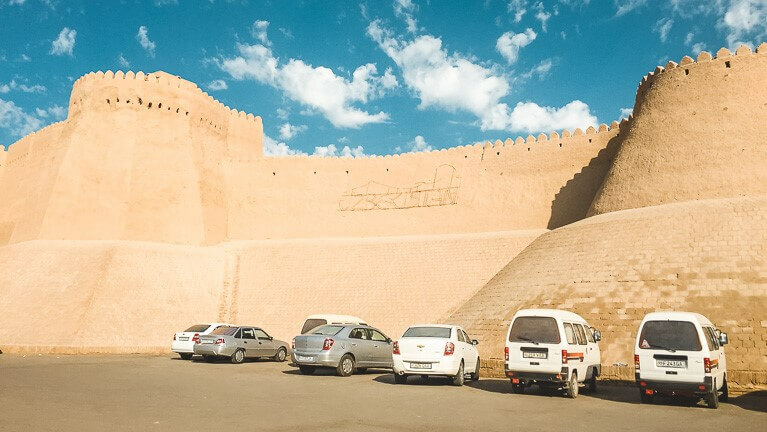 Khiva was one of the important stops of the Silk Road in modern Uzbekistan. 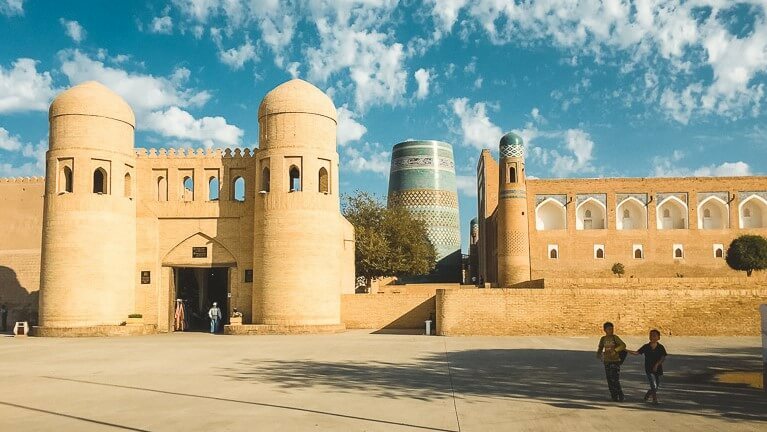 By the 17th century, it was the capital of the Khanate of Khiva, a rival to Bukhara. In 1873 it was swallowed up into the Russian Empire and for five years from 1920 was the capital of the Khorezm People’s Soviet Republic. In 1925 it was amalgamated with the Uzbek SSR. All this gives the multi-faceted city its charm today. One of the most popular legends about the city refers to the son of Noah, named Shem. Walking in the desert he found a spring with cool water and ordered his men to dig a well for travelers traversing the Karakum Desert. From then the well was carefully safeguarded and people tasting the fresh cool water exclaimed “Khei-vak” which can mean “delicious water” or “such a pleasure”. As time passed, a small settlement and caravanserai developed around the well and became part of the Great Silk Road. 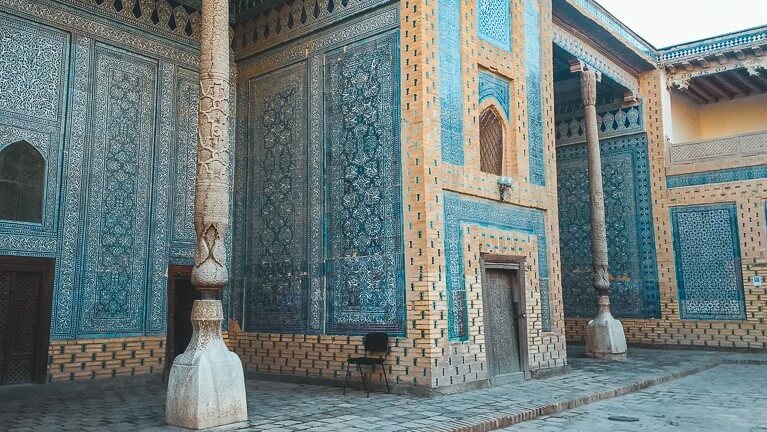 If you take a tour that stops in Khiva, this UNESCO-listed city will work its magic and you’ll be very glad you came.